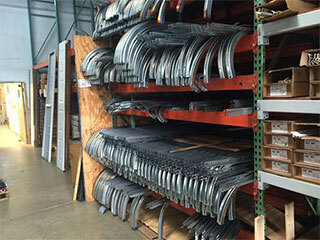 There are a lot of different garage door parts that help your system open and close smoothly. Among the major ones, you will find the lift cables, which are responsible for physically lifting the door, and the stationary tracks, which guide the rollers, and subsequently the panels, up and down during its opening and closing. Keeping these components in good condition is therefore very important, as it will help you avoid a lot of expensive and potentially dangerous accidents. Even though the lift cables do a lot of hard work, they don’t require much maintenance. You can check the cables for fraying, but not a lot more than that. Keep in mind that only certain parts of these units are likely to become frayed, and remember to look closely for cuts too. They increase the risk of these components snapping unexpectedly. If you do find evidence of damage timely cable replacement is important since a broken unit can leave your door inoperable and may cause it to start hanging to one side and even get off track, which will damage other hardware parts. The first task on the list when dealing with these components is checking them for obstructions and bending. While it’s easy to remove pebbles by hand, a bent track must be repaired immediately. If the problem is left unattended, the track may break. The next step involves checking for misalignment between the vertical and horizontal sections. This issue involves loosening the bolts and aligning the two sections. The cables and tracks need cleaning too, just like your door panels. You can use a mild solvent to treat them. Despite the common misconception, these components don’t require lubrication to ensure their smooth operation during the cold Connecticut winters. If you apply a lubricant to them, they will become too slippery and the door may start shaking, posing a considerable risk. If you have rollers with steel wheels, you should lubricate them to ensure that they will move smoothly along the tracks. You can spray some lubricant onto the wheels while the door is closing to get excellent results with minimal effort.